My kids and I just returned from a wonderful trip to New York. It was a fantastic city to visit and a very welcome break for me. 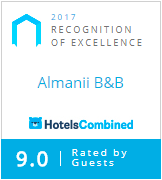 It has been a very busy year in Almanii B& B and I am hoping 2015 will be even better. It was also nice for me to be on the receiving end of what I do for a living, on my visit to New York, Any time I go away I look at what other accommodation providers provide, what I enjoyed, what I missed and when I come home I like to apply the things I enjoyed about where I stayed on holiday to my own B&B where possible.